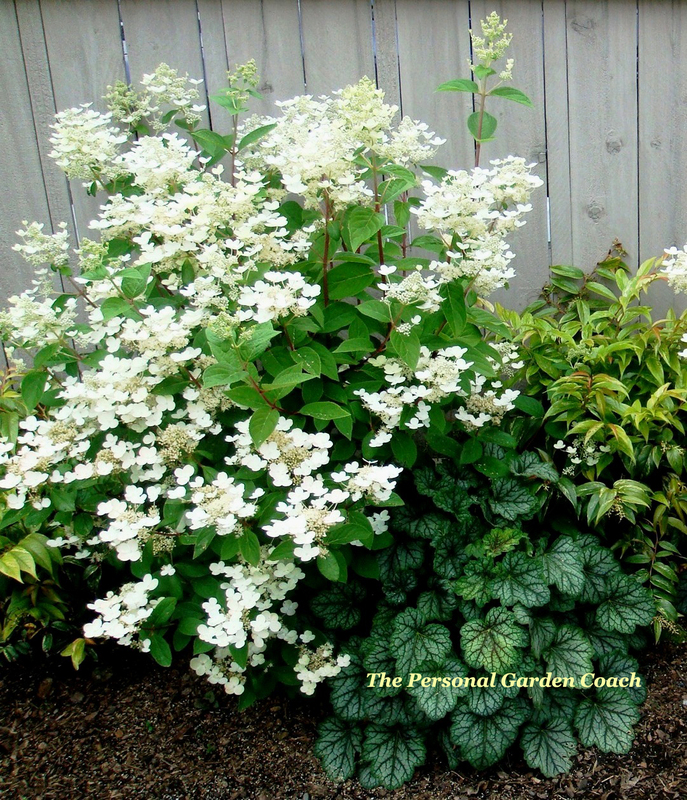 Hydrangea Paniculata and ALL of her relatives is one shrub that I would have to put on my “Never to be without” list of plants. I can only compare my passions for these shrubs by contrasting it this way: It is to Hosta lovers “Patriot”, it is to Rose enthusiasts “Mr. Lincoln”, it is to Edibles growers “Sweet Basil”. No longer can I be without some form of one in my garden. When I first started on this former bachelor pad back yard, there was only a sorry patch of grass. 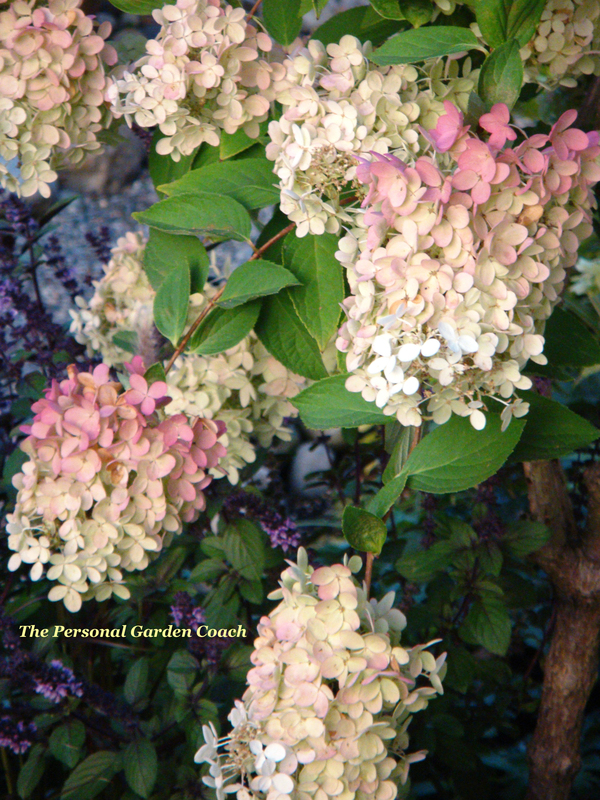 Among the very first plants I put in were three, three gallon pots of Hydrangea ‘Quick Fire’ by Proven Winners. What a fabulous LOW MAINTENANCE shrub! The benefits of incorporating this plant into any landscape are so terrific, I would be hard pressed to find a down side. They have a lovely, dark green leaf with a delicate texture. 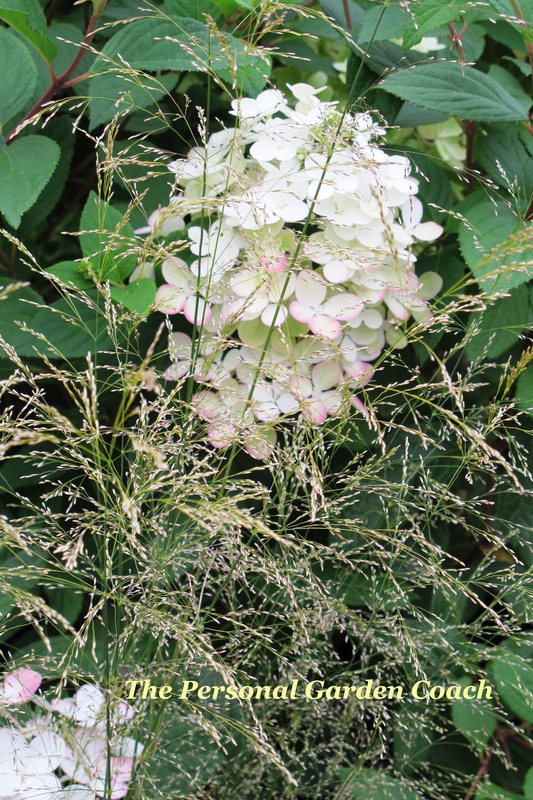 All Hydrangea Paniculata’s begin blooming at the opening bell of summer, with creamy white panicles. And with each passing day they produce more and more blooms that age with elegance. Each head of blooms color enriches more and more until it becomes a champagne peach, a blushing rose or even a dark, feisty mauve like ‘Quick Fire’, depending on which variety you may have. 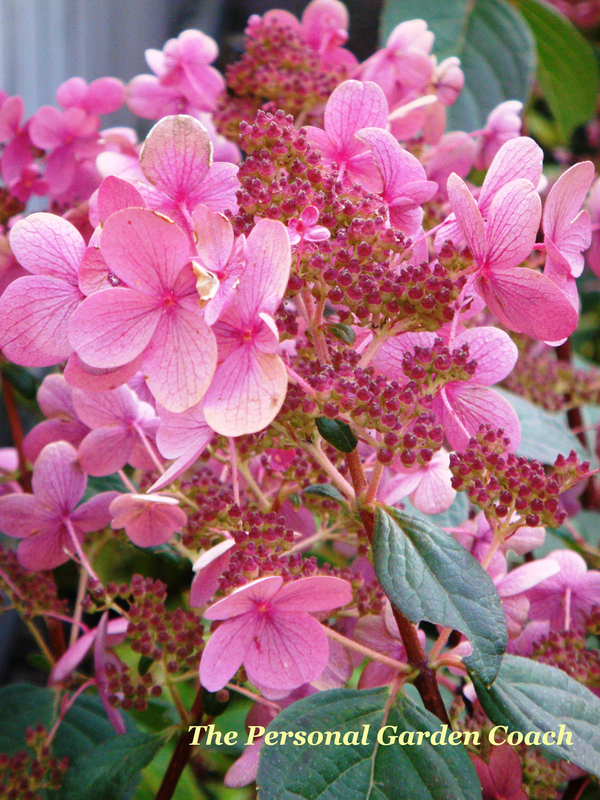 Soon after I got those in the ground, was fortunate to be able to buy a tree form of Hydrangea ‘Angel Blush’. She is smack in the middle of my dining room window at eye level and I adore her! ‘Angel Blush’ struts her stuff right up until the very last leaf has fallen and even then she will not drop her blooms unless I personally snip them off for winter flower arrangements. 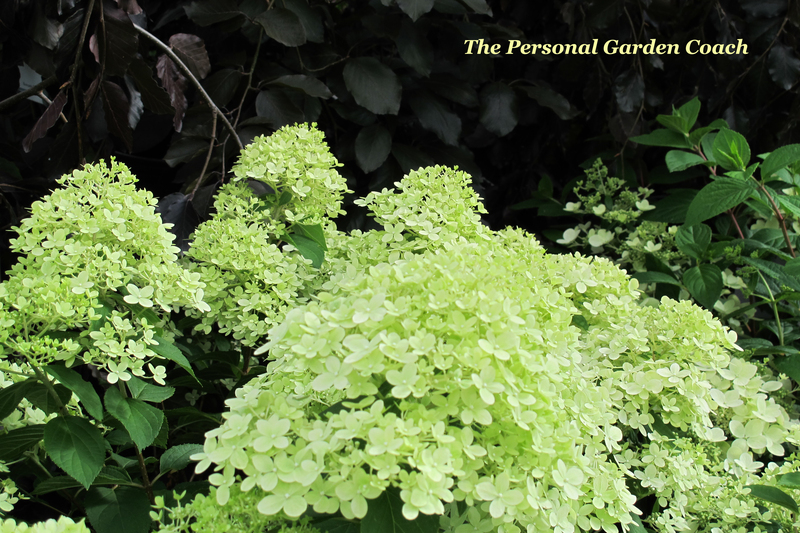 Cold hardy, non- fussy and performing to the end, Hydrangea Paniculata should not be missed- not if I have anything to say about it! Soon, I will have to make that list of mine:“The “Never To Be Without” Plant List. 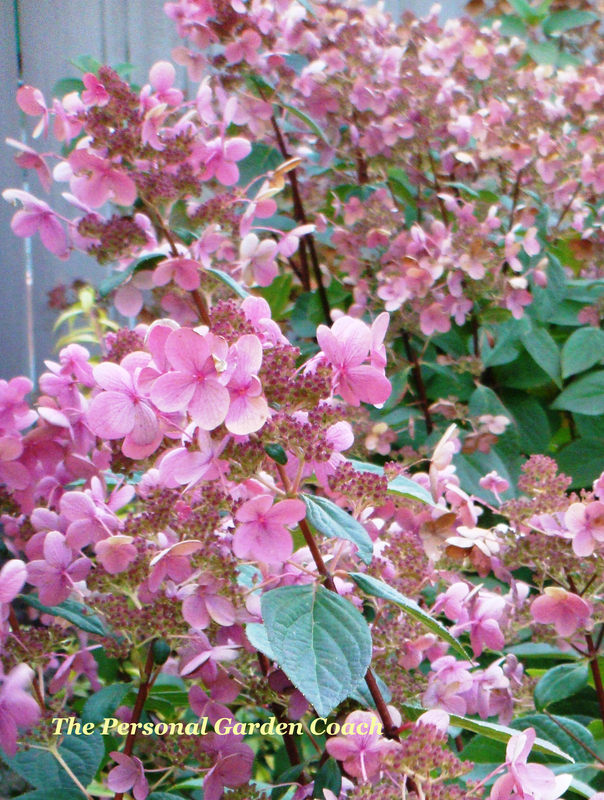 But, until then, the factored requirements to make it on my list have just gotten just a little bit harder due to the high performance bar set by these Hydrangea’s. 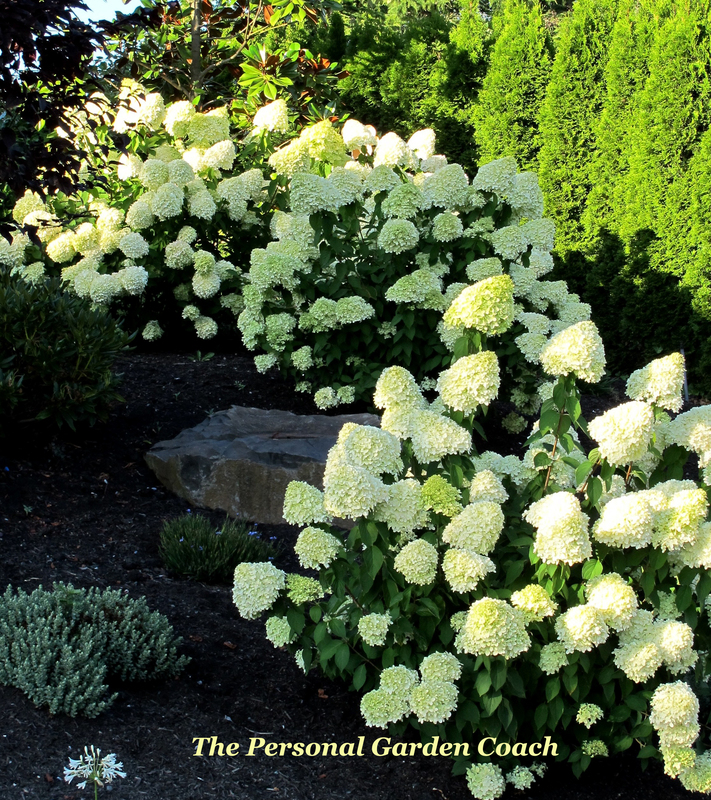 Now I’m jonesin to find a spot where I can load up the garden with Hydrangea ‘Limelight’. This creamy limecicle of a blooming shrub is truly fabulous and I can’t wait to figure out what other foliage colors I’ll put with it! 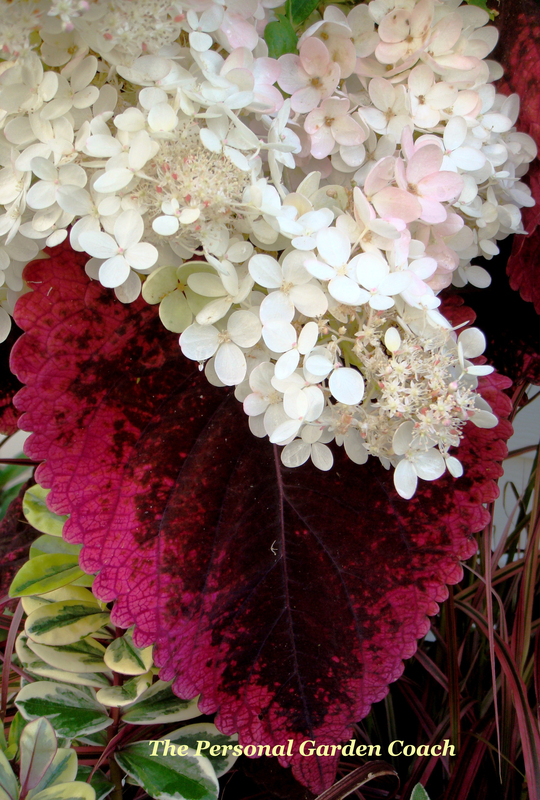 This entry was posted in Uncategorized and tagged 'Limelight' Hydrangea, 'Quick Fire' Hydrangea, Autumn, Color, Design, Fall, Flowers, Foliage, Garden, Garden Coaching, Garden Design, Garden Ideas, Garden Photography, Garden photos, Gardening, Gardening Blogs, Horticulture, House and Garden, Hydrangea Paniculata, Landscape, Landscape Design, Landscaping, Most Beautiful Flowers, most beautiful gardens, Photography, Plants, Proven Winners, Shrubs, The Personal Garden Coach. Bookmark the permalink. Quick Fire is on my short list as well! It’s looking really great right now in some of my gardens paired with ornamental grasses; especially Miscanthus ‘Adagio’ and M. ‘Morning Light’. Do you consult in Las Vegas,Nv? I just planted 2 quick fires in my yard. They are only about 2 feet tall right now. I can’t wait to watch them grown! We planted Quick Fire, Limelight and Pinky Winky varieties last summer. The deer LOVE the tender new growth, so we have been forced to fence in those varieties. The deer do not bother our other varieties. Oh, yes, and they also love the diablo ninebarks we put in last summer. Those are now also fenced. I want to plant several quick fires next to my patio for a little privacy. I live in Michigan, so when do you think the leaves will start to appear? If they don’t start until June or July, I might have to go with something else because I would like some privacy earlier. Sorry I missed your comment until now Deena! I hope that you tried the Hydrangea’s they don’t leaf out all that late. By late May you should see them full with leaves. We planted 6 Quickfire in mid-June this year. I’m a little concerned. 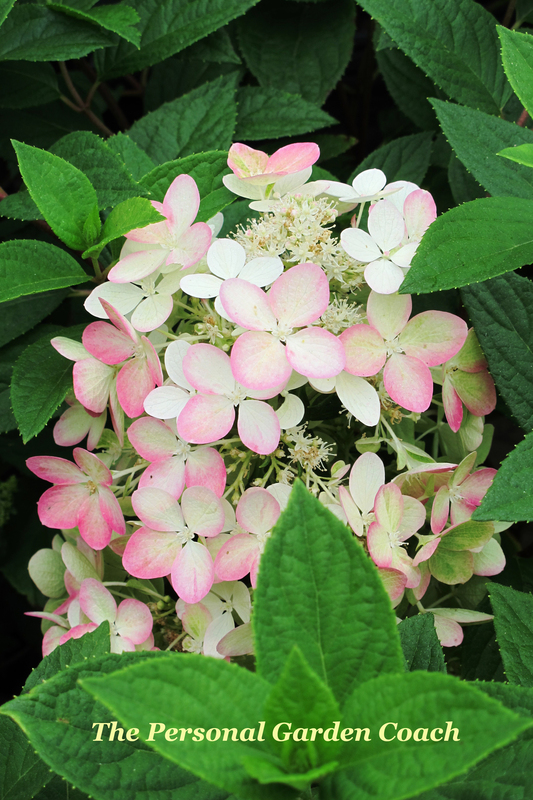 The flowers, yes, initially bloom white, then turn to pink, but they haven’t stayed pink long and have faded to a blush color and look like they are dry. The leaves don’t look dry, just the blossoms. It’s making me a bit crazy! I’m wondering if the amended soil (with fertilizers) my husband added to the bed has anything to do with how they look. They get early morning shade and then all day sun. Does anyone know what might be happening? Yes, this seems to happen with newly planted plants, but also with inconsistent watering as well. Mine do this in hotter than normal years when I have been lazy watering. If you are using a sprinkler system, make sure you have a good quality mulch down, about 1″ think and not black or overly dark and you need to understand that with above ground sprinklers it takes approximately 20 minutes for the water to get through the mulch layer before it ever makes its way to the roots. Better is a soaker hose (black recycled tire, not green or spraying) under the mulch, water for 3-4 hours 2-3 times per week, and you should be good.